Kiddie’s paradise INC. has dedicated to early education for over twenty years. Our owned brand “Weplay product family”- Rocking Bowel and Weplay Jumbo Circus have won the Taiwan Golden Pin Design Award and also earn the judges’ commendation. Rocking bowl is a toy to develop Children’s balance training. The idea is inspired from Mommy’s hug and the cradle. Children can either sit or lie in the Rocking Bowl to sway back-and-forth or even rotate 360 degrees. It gives children a new playing experience. Children can enhance their physical coordination and vestibule balance. 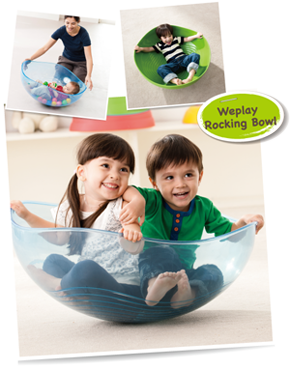 Moreover, Rocking bowl also wins the 2012 Parenting Award from Parenting Magazine in NY TOY FAIR. 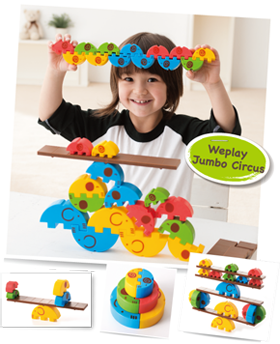 Weplay Jumbo Circus is a fun and multi functional toy that combines stacking blocks and balance concepts, which come up with a now concepts. Each set of Weplay Jumbo Circus includes 28 pieces of elephant shaped blocks and 4 planks. This is a wonderful game includes creativity, basic math concept, and basic physics concept. Children can play the seesaw balancing game with these blocks. Combining two half circle shaped blocks will get a full circle, and kids can pile the blocks together vertically or horizontally. Also, the game can develop kid’s stacking and balancing concept, and build a basic concept of the size sequence, color recognition and balancing concept. Weplay Jumbo Circus allows children to build up their creativity, and also it is a great activity for adults and senior care. Both products have been sold to many countries. They are multi-functional, interesting and designed for children. The high quality products are the hot items selling in the world. Welcome to experience our products!